ADRIC launched this important new guidebook during the ADRIC 2017 Conference when co-author Martha Simmons presented a session on the topic. It was a resounding success. 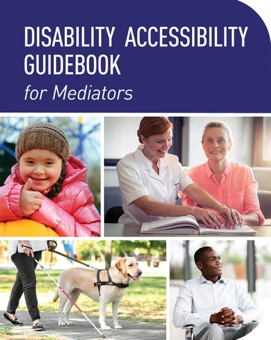 This guidebook discusses the importance of accessibility in mediation and provides concrete suggestions to increase access to the mediation process. You may also order a book by email. There is no charge, however, postage & handling charges will apply. ADRIC needs up to three more sponsors for $2500 for this invaluable guide. We will include your logo inside near the front. Let us know soonest to be recognized as supporting this important need! This guide discuss the importance of accessibility in Alternative Dispute Resolution and bring ideas to improve it. Don’t hesitate to share this sponsorship opportunity with your colleagues who might be interested!